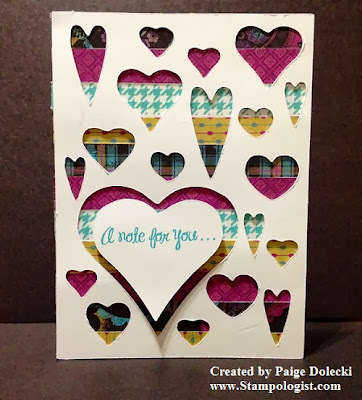 When I was perusing my e-mail today I came across a post from Lucy Abrams who was sharing a recent card she had published in a special paper crafts issue (see her post by clicking here). It was such an adorable card I had to immediately create one of my own! I used our Art Philosophy and Artiste cartridges to create this in CCR and let my Cricut do the heavy work of cutting for me. The stamp is from our "Just a Note" set that is still one of my favs. I used Laughing Lola paper and our Lagoon Washi tape for the background - super easy as all the strips were cut at .5"x4" to cover the card front. Love the card!!! It looks quick and easy to make (my type of card~no complications...lol), yet as if a lot of time was spent on it!!! Thanks for sharing the quick tips!!! Thanks Trish! Just for you, I put the CCR file out on the Hostess Club drive. I slightly modified it from this card but I think you'll like it!